There's something about the park's French version of boules that attracts attention. Pétanque seems to be a relatively simple game at first; a gravel playing area, a couple of wooden boards, and some shiny silver balls. 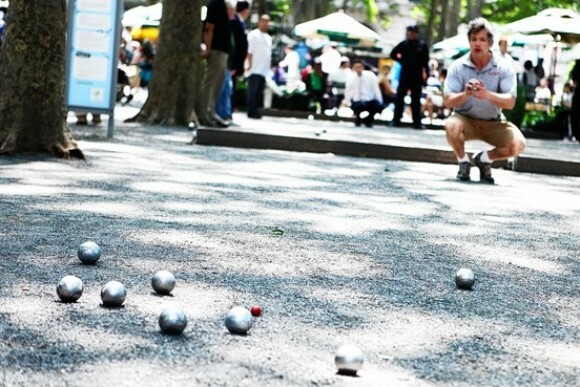 But our resident pétanque club La Boule New Yorkaise and the community of people who play at the courts in Bryant Park add a whole new dimension to the game. Joshua Robinson of The Wall Street Journal took note of this quirky game thriving in the park, and the personalities who give it life. He profiles a few of the regulars and lunchtime passersby in his article A Touch of France in Bryant Park.